Alvin and the Chipmunks (or Pinky and Perky if you prefer) have got a lot to answer for. 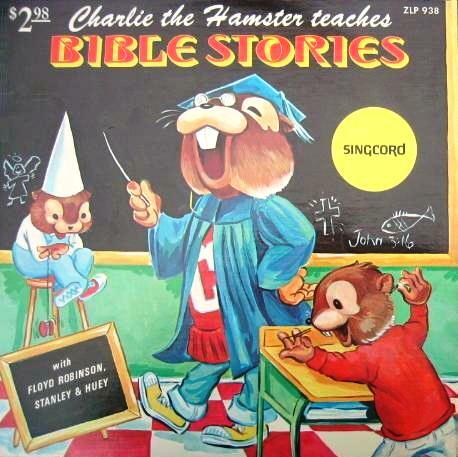 Charlie the Hamster along with his cousins Stanley and Huey, made a series of God bothering albums along with their human handler Floyd Robinson in the late 60s-early 70s before Ross Bagdasarian Jr - the son of Alvin's creator David Seville - sued Robinson in 1977 for plagiarism and copyright infringement. Robinson and his record companies quickly agreed to cease immediate production, distribution and sale of all of Robinson’s Charlie the Hamster records. Clearly 'thou shalt not steal' was one of the 10 commandments Charlie and Floyd decided could safely be ignored, as the pair produced some 14 albums of inane Christian caterwauling. Only Little Marcy the singing evangelistic dolly 'recorded' more christian crap than these critters. It's an unpleasant blemish on an otherwise reasonably distinguished career. Born in Nashville in 1938, Floyd Robinson was barely in his teens when he formed his first band, had regular shows on Nashville's WLAC and WSM radio stations whilst still in High School and toured with George Jones, Jim Reeves and others. In 1958 he wrote the novelty song The Little Space Girl for his cousin Jesse Lee Turner, who scored a top 20 hit with the song in 1959, the same year as Floyd scored his own top 20 debut with Makin' Love. Active throughout the 60s, 70s and 80s as a session musician, producer and engineer, more recently he has published two books, the instruction manual Guitar Playing Made Easy and the novel The Guitar. Nowadays Floyd has all but turned his back on music: he owns a used car dealership. 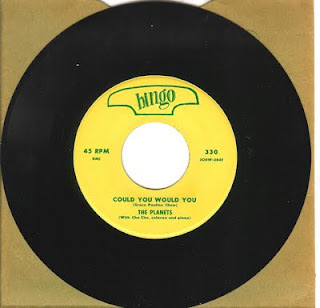 Following leads given by various WWR readers after I posted two earlier 45s penned by the gloriously inept Grace Pauline Chew, I recently tracked down (again, courtesy of GEMM) another hysterically awful single from a woman who has, for me at least, become the goddess of bad records. This particular pair of peculiar ditties, Could You Would You and Moon Crazy was released on Bingo Records in 1958. Bingo was, unsurprisingly, registered at the same Philadelphia address that was home to Art Service Music, the distributors of both the Musicart and Silver-Song labels, and home too to Grace Pauline Chew, her husband and son. The Planets, the act credited with this dreadful, positively atonal performance, are clearly Hank and Jimmy, who had previously performed Grace Pauline Chew's seminal Your the Only One For Me on Musicart. Both sides are perfectly dreadful. On Could You Would You The Planets are listed as being accompanied by 'Cha Cha, solovox and piano'. Whatever the 'Cha Cha' (their capitals, not mine) was, it appears to be mercifully silent; the solovox was a primitive, three-octave monophonic keyboard which employed vibrating metal reeds and an oscillator to create a vibrato effect. I love the fact that, although the unnamed solovox player makes several mistakes during this recording, no-one bothered to put him straight or decide that a second take was necessary. Given the quality of the sound coming out of the piano it has to be the same, discordant instrument employed on nearly every other one of Grace Pauline Chew's masterpieces. You have to wonder if the great lady herself sat at this omnipresent instrument during these obviously chaotic recording sessions. I've said it before, and no doubt I'll say it again, but truly this has to be one of the worst records ever made if not The World's Worst Record. And god, I love it. 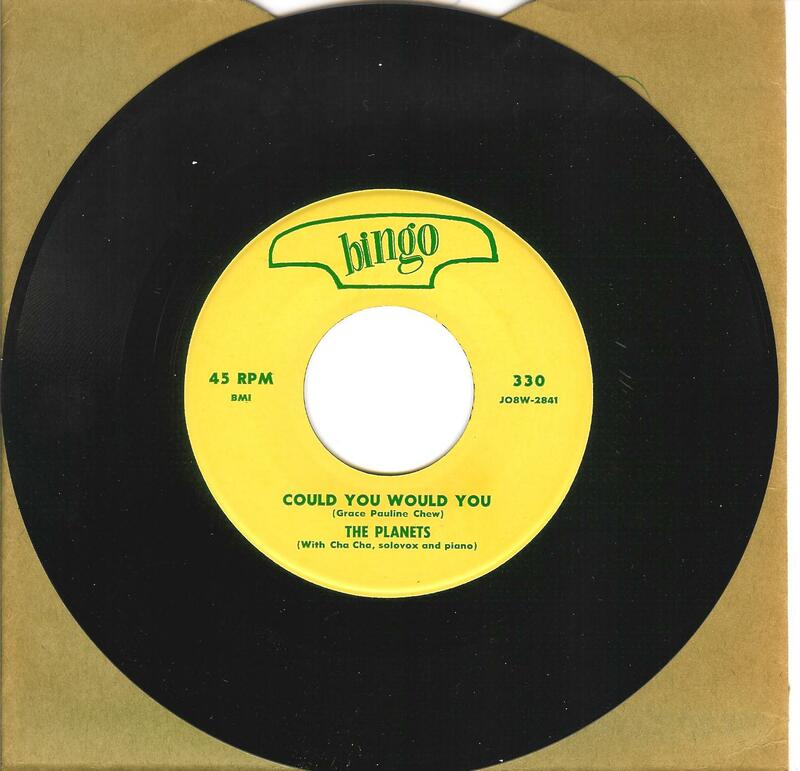 The following album – yes, a whole album’s worth or terrible music – comes our way via long-time WWR contributor Ross Hamilton, who, by bringing one of the tracks to my attention recently, inspired me to search for the entire work. Thanks again, Ross, for your tireless work at the coalface of mediocrity. Released on Glasgow Records (but not in Glasgow – I can just imagine how this rather bizarre preaching style would have gone down in the Gorbals), Father Pat Berkery appears to me to have been channelling the spirit of a not-quite-dead-yet Jim Morrison when he recorded his utterly peculiar 1969 album Prayers For a Noonday Church, reciting his cosmic, quasi-religious poetry over a trippy, psychedelic backing provided by a band named Spur. Father Berkery’s deadpan, some have called it ‘expressionless’, delivery adds to the absolute wrongness of the recording. One of the six children of James and Mary Kelly Berkery, Patrick Berkery was born in Brooklyn, New York where he contracted polio at a very young age and was treated in and received his grade school education at St. Charles Hospital, in Port Jefferson, New York. The nuns who cared for him did such a great job that he was able to enter the seminary and pursue college and graduate studies. After ordination, Father Pat was sent to Rome to obtain his Doctorate in Philosophy. While there he majored in Scholastic Philosophy, and upon completion of his doctoral studies, returned to teach in the Connecticut seminary where he prepared for the priesthood. The author of more than 20 books on religion, he taught philosophy in various seminaries throughout the US and wrote extensively on the spiritual life before passing away in 2010, in Connecticut, at the age of 70 – his last year on God’s earth spent suing the Archdiocese for failing to pay him his pension. Prayers For a Noonday Church was not Father Pat’s only foray into the recording studio: in 1974 he came up with the concept and was the principle researcher for the album The Rite of Exorcism (Crunch Records) although mercifully he seems to have kept his mouth shut this time during the recording process.